日本新大阪. The Residence Osaka - 5% GRR & What's Else? The Residence Osaka, a 15-storey Apartment building in Osaka, jointly developed by 2 biggest and well-known Japan Developers – Keihan Real Estate and Sumitomo Japan. The Residence comprising 304 residence units of 3 & 4 room types for choices. The Residence Osaka is conveniently located within 7 mins walk to the nearest subway station Higashi-Mikuni station and about 12 minutes walk to Shin-Osaka train station in Osaka that conveniently leads to the rest of Japan. Osaka – Japan 2nd Capital & 3rd Largest City, second most populous prefecture after Tokyo. 3 Bedroom from S$ 3xxk ! Up to 5% Rental Guarantee Over 2 years ! Projected 4% – 5% Rental Yield p.a. The Residence Osaka is conveniently located near Umeda and Namba with quick access to the main stations in Osaka within 7 mins and just one stop away from Shin-Osaka Station that connects to various part of Japan by the railway. The stations along the Midōsuji Line flourish residents living in The Residence with quality lifestyle needs. 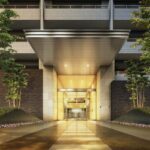 The Residence Higashi-Mikuni is located at Higashi-Mikuni with easy access to its transportation connectivity and many amenities such as restaurants and shopping arcades. 5. Balance 90% payment via TT to developer project account upon legal completion.